Chest radiograph in a 30-year-old woman who presented with shortness of breath and a palpable swelling over the right parietal region. 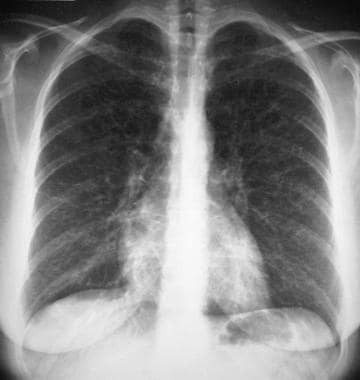 The radiograph shows an interstitial lung pattern with a honeycomb appearance in the upper zones (see the next image). 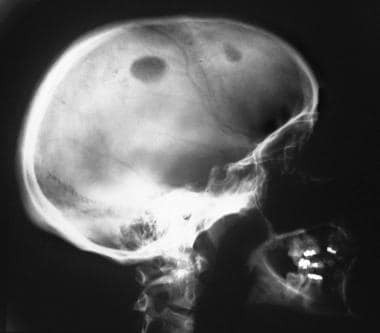 Lateral skull radiograph in a 30-year-old woman with shortness of breath and a palpable swelling over the right parietal region shows 2 purely lytic lesions in the frontoparietal region of the skull. The larger parietal lesion has beveled edges, suggestive of an eosinophilic granuloma. Biopsy results confirmed the diagnosis of eosinophilic granuloma. Transaxial nonenhanced computed tomography scans of the skull in a 28-year-old woman who presented with a palpable swelling over the calvarium. Scanogram of the patient's skull shows a geographic lytic lesion within the parieto-occipital region. Transaxial scan through the vertex, examined in a bone window, shows an expanding lytic lesion within the diploic space (see the next image). Transaxial nonenhanced computed tomography scans through the vertex in a 28-year-old woman with a palpable swelling over the calvarium, examined in a brain window. Images show destruction of both the outer and inner tables of skull; however, no brain involvement is noted. Eosinophilic granuloma may masquerade as an aggressive periodontitis  ; therefore, eosinophilic granuloma should be considered when an expanding lytic jaw lesion is encountered. A wide variety of bone lesions may mimic eosinophilic granuloma; these include infections, traumatic lesions, and neoplasms. A false-negative diagnosis of eosinophilic granuloma is exceptional when plain radiographic findings are used, although difficulty may be encountered with lesions in areas with more complex anatomy, such as the posterior elements of the vertebral bodies. In these cases, conventional tomography or CT scanning may be useful. With radionuclide scanning, the false-negative rate is 30%. The differential diagnosis of eosinophilic granuloma includes aneurysmal bone cyst, bone infarct and bone metastases, thoracic eosinophilic granuloma, and fibrous dysplasia, as well as acute pyogenic, chronic, and variant osteosarcoma. When the skull is involved, the following conditions should be considered: venous lake; meningocele, encephalocele, and cranium bifidum; arachnoid granulation; parietal foramen; epidermoid cyst; hemangioma; cholesteatoma; fibrous dysplasia; metastasis; surgical defect; and osteomyelitis. When the long bones are affected, Ewing sarcoma, chronic osteomyelitis, Brodie abscess, and chondroblastoma should be considered. Other interstitial lung diseases should be taken into consideration with pulmonary involvement. Plain radiography remains the mainstay of diagnosis in patients with eosinophilic granuloma, although a specific diagnosis cannot always be made without bone biopsy, because children and adolescents are not spared skeletal neoplasms. In descending order of frequency, sites involved with monostotic osseous disease include the calvarium, mandible, ribs, long bones of the upper extremity, pelvis, and vertebrae (see the following images). Anteroposterior radiograph of the mandible (left image) in a 10-year-old boy who presented with swelling of the left mandible. A lytic expanding lesion is seen within the ramus of the left mandible. An oblique view of the mandible (right image) shows floating teeth within the lytic bone lesion (see the angiogram). 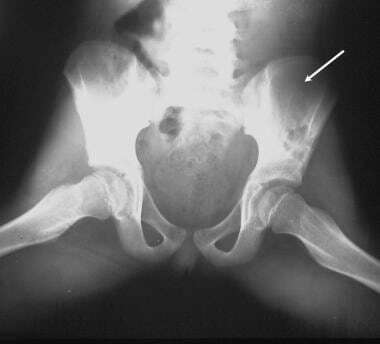 Plain radiograph of the pelvis in a 10-year-old girl shows a lytic lesion of eosinophilic granuloma within the left ileum. Biopsy results confirmed the diagnosis of eosinophilic granuloma. Chest radiograph in a 9-year-old boy who presented with mid dorsal pain. Note the collapsed vertebra and paraspinal soft-tissue mass. Anteroposterior radiograph of the dorsal spine in a 9-year-old boy with mid dorsal pain. These results confirm the chest radiographic findings. When tubular bones are involved in eosinophilic granuloma, diaphyseal and metaphyseal localization is more frequent than epiphyseal localization. Epiphyseal lesions may cross the open physeal plate. The skull is affected in one half of patients, [5, 9] including the diploic space of the parietal and temporal bones. Skull lesions are lytic, with a beveled edge or sharp and serrated margins and the absence of sclerosis in calvarial lesions. A hole-within-a-hole appearance may occur as a result of uneven erosion of the inner and outer tables of the skull. In addition, sclerosis may occur around orbital lesions, and marginal sclerosis may occur during the healing phase in up to 50% of patients with a calvarial lesion. A button sequestrum is seen because a central bone opacity within a lytic lesion is an unusual presentation. 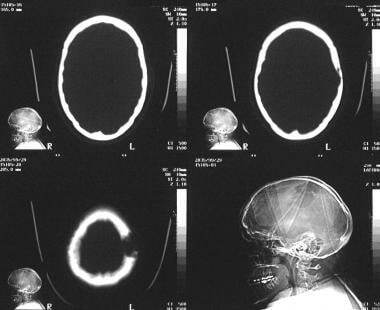 A soft-tissue mass may be obvious overlying the skull defect; this mass is often clinically palpable. A soft tissue mass is also occasionally seen with orbital lesions, with or without underlying bone erosion. Mandibular lesions may be associated with gingival and soft-tissue swelling and floating teeth (see the image below). The ribs show lytic expansile lesions, which may be associated with pathologic fractures. The scapulae and pelvis show destructive lesions; periosteal elevation is minimal, and some lesions show sclerotic margins, particularly lesions occurring in the supra-acetabular regions. Long bones below the knees and distal to the elbows are rarely involved. Lesions are lytic, round or oval, and expansile, with ill-defined or sclerotic margins. The medullary cavity may be expanded and may be associated with cortical thinning, intracortical tunneling, and erosion of the cortex, as well as an adjacent soft-tissue mass. Laminated periosteal new bone formation is common around the involved segment of bone, but spread across growth plates is unusual. Tubular long bone lesions may appear rapidly over 3 weeks. Lung involvement is seen in as many as 20% of patients and an older subset (ie, aged 20-40 yr), with an incidence of 0.05-0.50 per 100,000 patients annually. Plain radiographic findings may demonstrate an alveolar pattern in an early stage, which may be followed by nodular shadows (3-10 mm) and/or a reticulonodular pattern with a predilection for the apices. Eventually, fibrosis and a honeycomb lung may ensue. 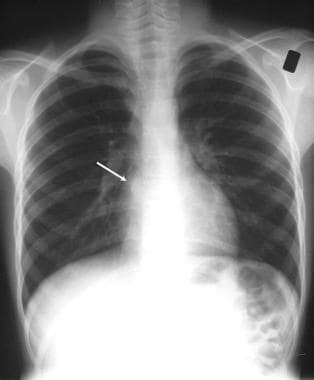 Recurrent pneumothoraces occur in 20% of patients. Hilar lymphadenopathy and pleural effusions are rare. CT scanning is considerably better than plain radiography and conventional tomography in depicting an intracranial extension of eosinophilic granuloma. CT scans may be particularly useful in osseous lesions in areas with complex anatomy, such as the mastoids, atlantoaxial joints, and posterior elements of the vertebral bodies. Also, soft-tissue components are better depicted with CT scanning than with other imaging modalities. The destruction of the mastoid, petrous ridge, tegmen tympani, and lateral sinus plate and the destruction of the inner and external ear are depicted elegantly on CT scans (see the images below). 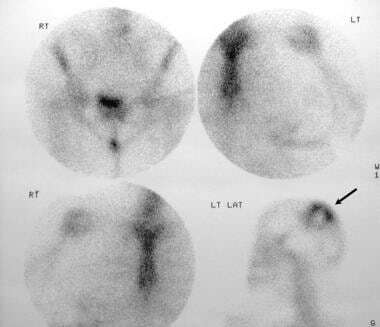 CT scans may demonstrate an isoattenuating and homogeneously enhancing mass in the hypothalamus/pituitary gland. CT scan appearances of eosinophilic granuloma are nonspecific, and a variety of inflammatory and neoplastic processes may mimic this condition. The value of using MRI for patients with eosinophilic granuloma lies in the sensitivity of this modality; its specificity is low. However, the cost of the procedure and the procedural problems encountered in imaging young children confer no advantages over plain radiography. 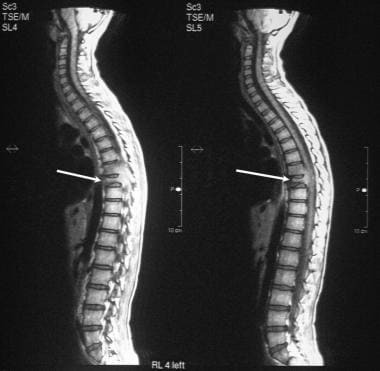 T1-weighted nonenhanced sagittal magnetic resonance image through the spine in a 9-year-old boy with mid dorsal pain shows the vertebra plana. Note the preserved disk spaces. Biopsy results confirmed the diagnosis of eosinophilic granuloma. Conventional radiography, CT, and radionuclide imaging usually diagnose these lesions. Ultrasound of the skull with guided core biopsy has previously been reported in 3 cases with excellent results. Viewing of the frontal bone solitary eosinophilic granuloma with ultrasound has been found instructive and useful. 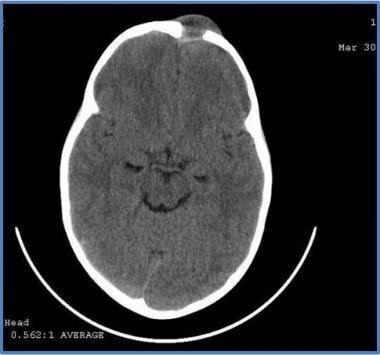 CT image of a 4-year-old boy with long-standing (1 y) gradually increasing swelling over the forehead (left to the midline). Courtesy of Ravi Devidas Kadasne, MBBS, MD, Specialist in Radiology, Emirates International Hospital, UAE. 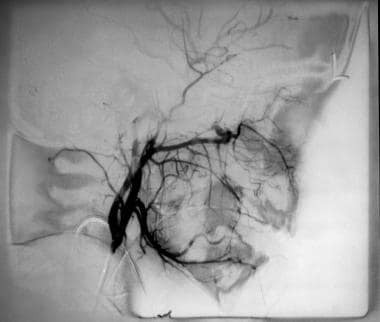 Compare the vascularity of an eosinophilic granuloma in the first image below, where only stretching of the vessels is noted on the angiography. Doppler interrogation in the second image below show internal vascularity not previously shown. External carotid angiogram in a 10-year-old boy with swelling of the left mandible shows an avascular mass within the mandible, with stretching of the vessels around the lytic lesion. Biopsy results confirmed the diagnosis of eosinophilic granuloma. Radiographic examination and radionuclide bone imaging are complementary techniques in detecting bone lesions in bone marrow disorders, including eosinophilic granuloma. Scintigraphy is more useful in cases of unifocal eosinophilic granuloma than in cases of multifocal disease, in which radiography is superior. Negative radionuclide findings occur in 35% of patients with known eosinophilic granuloma in whom plain radiographic findings are positive. Eosinophilic granuloma shows a variety of activity patterns on radionuclide bone scintigrams obtained by using technetium-99m (99mTc) diphosphonate. The bone lesions may be hot, cold, or cold with an area of increased surrounding reparative-ring activity. Areas of increased activity vary in intensity. In the lower limbs, eosinophilic granuloma lesions tend to appear more elongated and diffuse than bone metastasis. Recurrences are identified more readily with fewer false-negative findings (see the image below). Radionuclide bone scans in a 28-year-old woman with a palpable swelling over the calvarium show a solitary lesion within the skull and a photon-deficient mass surrounded by a rim of intense activity. Biopsy results confirmed the diagnosis of eosinophilic granuloma. Angelini A, Mavrogenis AF, Rimondi E, Rossi G, Ruggieri P. Current concepts for the diagnosis and management of eosinophilic granuloma of bone. J Orthop Traumatol. 2017 Jun. 18 (2):83-90. [Medline]. [Full Text]. Zhang X, Zhou J, Chai X, Chen G, Guo B, Ni L, et al. The application of x-ray, computed tomography, and magnetic resonance imaging on 22 pediatric Langerhans cell histiocytosis patients with long bone involvement: A retrospective analysis. Medicine (Baltimore). 2018 Apr. 97 (17):e0411. [Medline]. [Full Text]. Azouz EM, Saigal G, Rodriguez MM, Podda A. Langerhans' cell histiocytosis: pathology, imaging and treatment of skeletal involvement. Pediatr Radiol. 2005 Feb. 35(2):103-15. [Medline]. Haouimi AS, Al-Hawsawi ZM, Jameel AN. Unusual location of eosinophilic granuloma. Saudi Med J. 2004 Oct. 25(10):1489-91. [Medline]. Park SH, Park J, Hwang JH, Hwang SK, Hamm IS, Park YM. Eosinophilic granuloma of the skull: a retrospective analysis. Pediatr Neurosurg. 2007. 43(2):97-101. [Medline]. Vanhoenacker FM, De Beuckeleer LH, De Roeck F, et al. Metachronous eosinophilic granuloma of bone. JBR-BTR. 2000 Oct. 83(5):234-7. [Medline]. Greis PE, Hankin FM. Eosinophilic granuloma. The management of solitary lesions of bone. Clin Orthop. 1990 Aug. (257):204-11. [Medline]. Aricò M, Astigarraga I, Braier J, Donadieu J, Gadner H, Glogova E, et al. Lack of bone lesions at diagnosis is associated with inferior outcome in multisystem langerhans cell histiocytosis of childhood. Br J Haematol. 2015 Apr. 169 (2):241-8. [Medline]. Yang JT, Chang CN, Lui TN, Ho YS. Eosinophilic granuloma of the skull--report of four cases. Changgeng Yi Xue Za Zhi. 1993 Dec. 16(4):257-62. [Medline]. Yanagawa T, Watanabe H, Shinozaki T, et al. The natural history of disappearing bone tumours and tumour-like conditions. Clin Radiol. 2001 Nov. 56(11):877-86. [Medline]. Silvestros SS, Mamalis AA, Sklavounou AD, Tzerbos FX, Rontogianni DD. Eosinophilic granuloma masquerading as aggressive periodontitis. J Periodontol. 2006 May. 77(5):917-21. [Medline]. Ahlawat S, Khandheria P, Subhawong TK, Fayad LM. Differentiation of benign and malignant skeletal lesions with quantitative diffusion weighted MRI at 3T. Eur J Radiol. 2015 Jun. 84 (6):1091-7. [Medline]. Inci MF, Inci R, Ozkan F. Multidetector CT findings of calvarial eosinophilic granuloma. BMJ Case Rep. 2013 May 22. 2013:[Medline]. Abdel-Aziz M, Rashed M, Khalifa B, Talaat A, Nassar A. Eosinophilic granuloma of the temporal bone in children. J Craniofac Surg. 2014 May. 25 (3):1076-8. [Medline]. Raab P, Hohmann F, Kuhl J, Krauspe R. Vertebral remodeling in eosinophilic granuloma of the spine. A long- term follow-up. Spine. 1998 Jun 15. 23(12):1351-4. [Medline]. Greenlee JD, Fenoy AJ, Donovan KA, Menezes AH. Eosinophilic granuloma in the pediatric spine. Pediatr Neurosurg. 2007. 43(4):285-92. [Medline]. Fenoy AJ, Greenlee JD, Menezes AH, Donovan KA, Sato Y, Hitchon PW, et al. Primary bone tumors of the spine in children. J Neurosurg. 2006 Oct. 105(4 Suppl):252-60. [Medline]. Osenbach RK, Youngblood LA, Menezes AH. Atlanto-axial instability secondary to solitary eosinophilic granuloma of C2 in a 12-year-old girl. J Spinal Disord. 1990 Dec. 3(4):408-12. [Medline]. Bodner G, Kreczy A, Rachbauer F, Baechter O, Peer S. Eosinophilic granuloma of the bone: ultrasonographic imaging. Australas Radiol. 2002 Dec. 46(4):418-21. [Medline]. Flores LG 2nd, Hoshi H, Nagamachi S, et al. Thallium-201 uptake in eosinophilic granuloma of the frontal bone: comparison with technetium-99m-MDP imaging. J Nucl Med. 1995 Jan. 36(1):107-10. [Medline]. Ohshimo S, Guzman J, Costabel U, Bonella F. Differential diagnosis of granulomatous lung disease: clues and pitfalls: Number 4 in the Series "Pathology for the clinician" Edited by Peter Dorfmüller and Alberto Cavazza. Eur Respir Rev. 2017 Sep 30. 26 (145):[Medline]. [Full Text]. Obert J, Vercellino L, Van Der Gucht A, de Margerie-Mellon C, Bugnet E, Chevret S, et al. 18F-fluorodeoxyglucose positron emission tomography-computed tomography in the management of adult multisystem Langerhans cell histiocytosis. Eur J Nucl Med Mol Imaging. 2017 Apr. 44 (4):598-610. [Medline]. Image of a 4-year-old boy with long-standing (1 y) gradually increasing swelling over the forehead (left to the midline). Courtesy of Ravi Devidas Kadasne, MBBS, MD, Specialist in Radiology, Emirates International Hospital, UAE. Ultrasound image of a 4-year-old boy with long-standing (1 y) gradually increasing swelling over the forehead (left to the midline). Courtesy of Ravi Devidas Kadasne, MBBS, MD, Specialist in Radiology, Emirates International Hospital, UAE. Eosinophilic granuloma. Courtesy of Ravi Devidas Kadasne, MBBS, MD, Specialist in Radiology, Emirates International Hospital, UAE. Disclosure: Received royalty from Oxford Press for book author/editor & reviewer; Received royalty from Elsevier Press for book author / editor.